The frame is practically non-existent, which is something I like. There is nothing worse than crouching down in the drops or doing a quick shoulder check to find that there is a piece of plastic in your line of sight. The 6th Sense offer a massive field of vision without you even moving your head. The 6th Sense are basically a set of components clipped to the lens: arms, nosepiece, top clip and aero fairings all detach with a simple twist. You can buy additional lenses to go with your frame, varying shades and even photochromic ones. 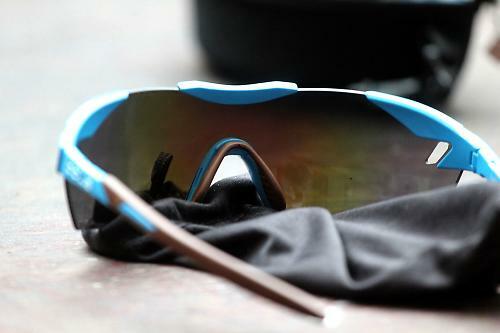 The AG2R versions here come with 'neutral grey with a blue violet mirror for bright conditions'. Those fairings clip onto the arms to create a streamlined helmet/glasses combo, plus they stop air or sunlight coming in through the side – almost like blinkers on a racehorse – yet they are far enough back to not restrict vision. While we are on the subject of the lens, there are a couple of coatings to take a look at. Its Hydrophobic/Olephobic treatment basically repels water and oil, making it bead off the lens. It works well too, preventing water marks and even sweat and fingerprint marks. Well, they're still there, but just a lot less smeary than some with lenses, something you really notice when you ride into low sun typical of this time of year. The lens also comes with an anti-fog coating on the inside to stop it misting up in humid conditions, and there are vents near each arm, which help keep air circulating so you don't get any visibility issues. The only problem you might have is if you suffer from hayfever – the breeze can really whip in once you pick up speed and you can feel it blowing over your eyes. As far as fit goes, you certainly don't get any issues with slippage when the going gets a little bit sweaty. Both the nosegrip and temple grips are made of a hydrophilic polymer designed to absorb moisture; on a particularly hot day things can get overwhelmed, but they do continue to grip your face without any irritation. The nosepad is adjustable too. You either squeeze or expand the grip and it stays put. Overall, at 28g they are unbelievably light and you barely know you are wearing them. The arms apply enough pressure to keep a grip even when you're looking down, without being uncomfortable, the nose grip the same. 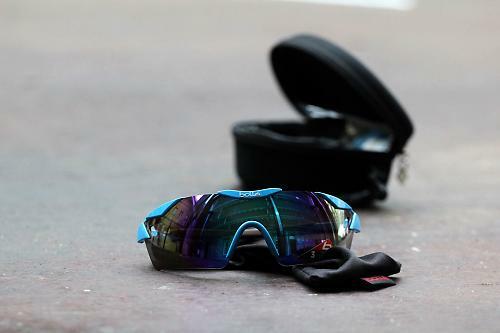 They do feel a little flimsy in your hand in comparison to some – my Oakley Radars or the RH+ ones I tested a while back, anyway – but in practice I never felt I had to be careful with them. Sunglasses have always been a fashion item and that can drive prices just as much as the technology, but while the Bollé are expensive, they are quite reasonably priced against the opposition. We've got the pro team AG2R La Mondiale version of the Bolle 6th Sense glasses, so it's safe to say they are aimed at the top end of the market. Seriously light with excellent clarity means they feel exactly how I'd expect a pair of sunglasses costing £150. Put together well, with plenty of screws used rather than just push fit. Great fit, excellent clarity and field of vision. Low weight means you barely know you are wearing them. They feel more flimsy than my Oakley Radars, though that doesn't mean they won't stand up to longterm use. No pressure points anywhere and the adjustable nose pads allow for a custom fit. I like sunglasses so I'd probably spend more than most, but I reckon the cost is comparable to the competition. Great sunglasses in terms of fit, lens clarity and field of vision, but hayfever sufferers might not get on with the lens vents. The blue and brown colour combination, others are available though. The light weight, cool looks and aero additions mean the 6th Sense are pretty well up there in the fashion stakes, plus that is all backed up with a really good lens. The clarity and field of vision allowed by the curved shape means they are some of the best glasses I've used for multiple riding disciplines. The only thing that lets them down is a slightly flimsy feel. Seriously you guys, in reviews like this you need to make mention of whether or not prescription inserts are available. How did they perform in bright sunshine? Looking at the various options on the prescription ones, it seems the prices only start at £300. Ouch. They look great, but Bolle do great specs for a tenner. We used to use Bolle at work, they do prescription in most of their sport and industrial ranges. If I spend big money on bins, I usually break them! I use bolle glasses, but usually the <£10 clear ones on eBay. Great if you have a tendency to lose them.